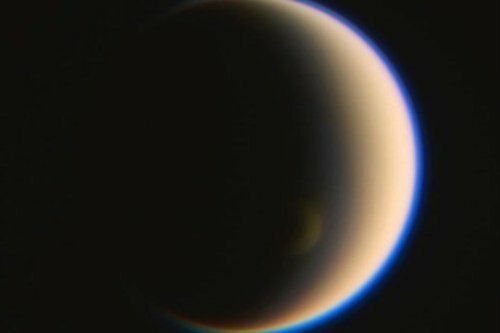 A new study led by a University of Bristol earth scientist has shown that recently reported unexpected behaviour on Titan, the largest moon of Saturn, is due to its unique atmospheric chemistry. Titan’s polar atmosphere recently experiences and unexpected and significant cooling, contrary to all model predictions and differing from the behaviour of all other terrestrial planets in our solar system. Titan is the largest moon of Saturn, is bigger than the planet Mercury, and is the only moon in our solar system to have a substantial atmosphere. Usually, the high altitude polar atmosphere in a planet’s winter hemisphere is warm because of sinking air being compressed and heated — similar to what happens in a bicycle pump. Puzzlingly, Titan’s atmospheric polar vortex seems to be extremely cold instead. Before its fiery demise in Saturn’s atmosphere on September 15, the Cassini spacecraft obtained a long series of observations of Titan’s polar atmosphere covering nearly half of Titan’s 29.5 earth-year long year using the Composite Infrared Spectrometer (CIRS) instrument. The Cassini/CIRS observations showed that while the excepted polar hot spot did begin to develop at the start of winter in 2009, this soon developed into a cold spot in 2012, with temperatures as low as 120 K being observed until late 2015. Only in the most recent 2016 and 2017 observations has the expected hot-spot returned. Lead author Dr Nick Teanby from the University of Bristol’s School of Earth Sciences, said: “For Earth, Venus, and Mars, the main atmospheric cooling mechanism is infrared radiation emitted by the trace gas CO2 and because CO2 has a long atmospheric lifetime it is well mixed at all atmospheric levels and is hardly affected by atmospheric circulation. These gases are produced high in the atmosphere, so have a steep vertical gradient, meaning that their abundances can be significantly modified by even modest vertical atmospheric circulations. Therefore, winter polar subsidence led to massive enrichments of these radiatively active gases over the southern winter pole. Researchers used the temperature and gas abundances measured with Cassini, coupled with a numerical radiative balance model of heating and cool rates, to show that trace gas enrichment was large enough to cause significant cooling and extremely cold atmospheric temperatures. This explains earlier observations of strange hydrogen cyanide ice clouds that were observed over the pole in 2014 with Cassini’s cameras.